In 1602, the Spaniards built the historical fortress of PORTA VAGA, a 20-foot high fort that guarded the entrance to the Spanish city. The name could have been suggested by the Tagalog puertang bago (“new door”). 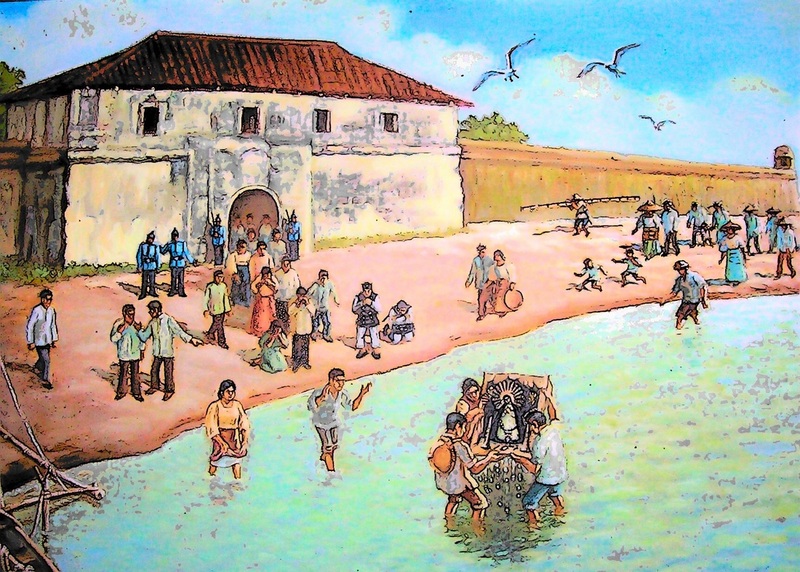 The massive walls of San Felipe were erected in 1614 to protect the navy yard against incursions by Moro pirates, Dutch invaders and other groups opposing their rule. During the American era, it was used as a station of the US Marines. It was eventually destroyed during the Second World War. The city was officially baptized Cavite that year when it was established as a politico-military district and capital of Cavite province. The Isthmus del Rosario linked Cavite with the mainland. Cavite. 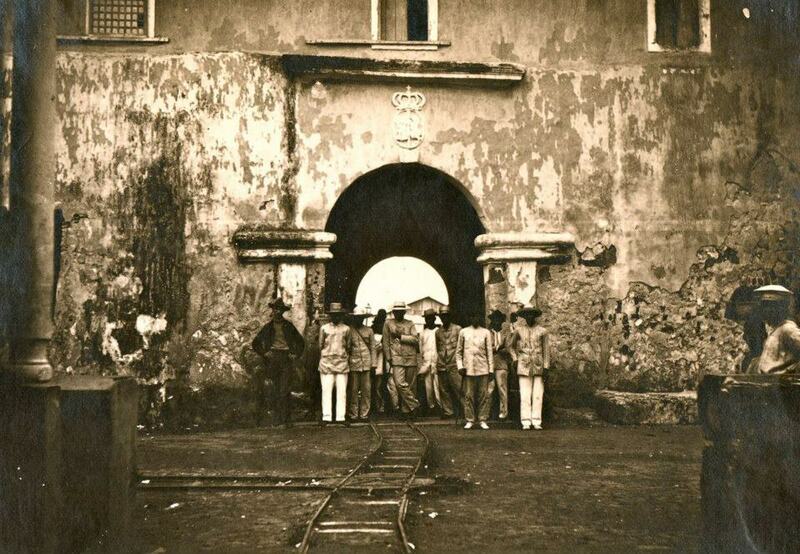 Filipino Army of Liberation soldiers, walls and gateway and leading to San Roque, 1899. Photo courtesy of Matthew Westfall. A serene and sunny morning followed the stormy night. 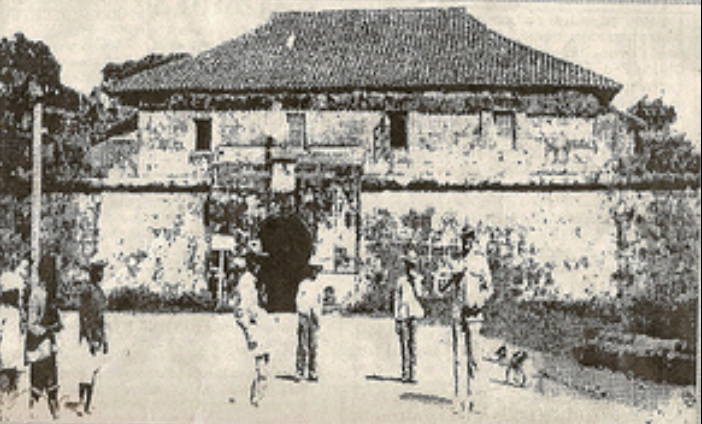 The early risers, mostly fishermen and workers at the Cavite Royal Arsenal usually passed through the Porta Vaga gate in entering the puerto. Along the beach of Cañacao Bay, they found a framed image of the Virgen de la Soledad lying on the sandy shore. It was close to the spot where the Virgin appeared the previous night. Others claimed it came with the debris of a Spanish galleon that sank during the fierce typhoon. They brought the image to the parish priest, who temporarily installed it in the parish church. 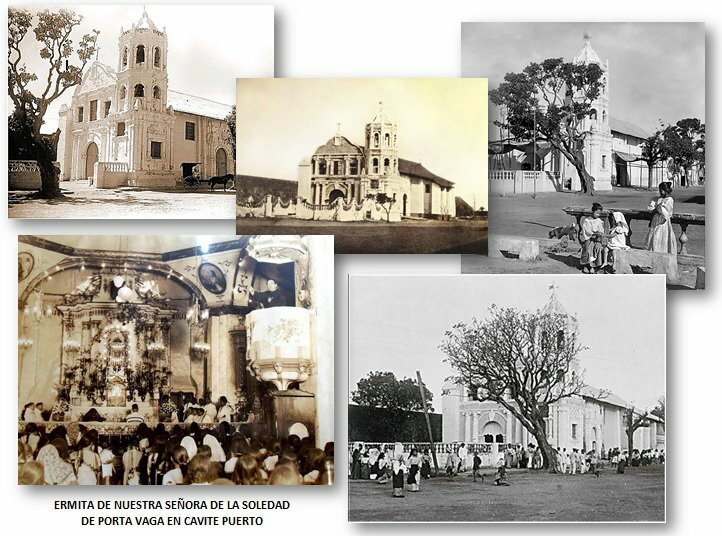 Later, a small chapel was built near the Porta Vaga walls and for three centuries it became the shrine of the Virgen de la Soledad. 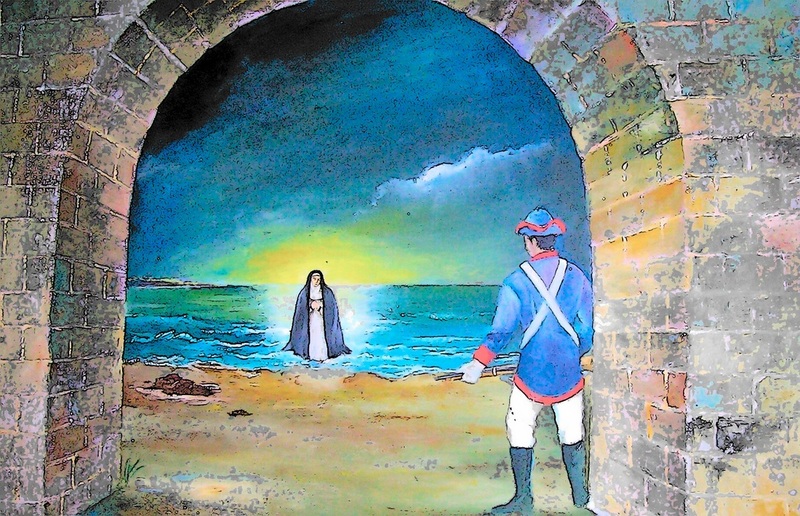 Along the beach of Cañacao Bay, they found a framed image of the Virgen de la Soledad lying on the sandy shore. Legends do not satisfy the curiosity of a seeker. The heavy files of history prove to be an accomodating ally in the earnest search for the truth about the Virgin. 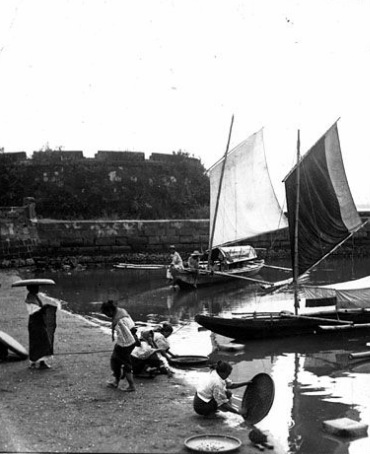 In the past, numerous Caviteño writers attempted to give a definite date of Her arrival. Some said that it must be during the second half of the seventeenth century. Others would give a more definite year –1667. Inspite all available data, the Virgin’s origins and arrival to Cavite is still shrouded with mystery. Perhaps this is one of the main reasons why many devotees have been drawn to Her aura all these years. One thing remains unchallenged even with the advent of changing lifestyles and revolutionary breakthroughs in almost all aspects of human life. Cavite will never be the same again without its Patroness. That, history will find improbable, if not impossible to write. 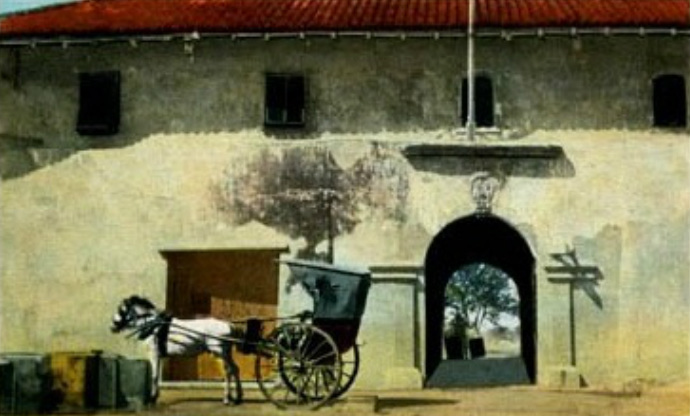 Alleged Painting of Fernando Amorsolo of the Wall and Ermita de Porta Vaga. Pious devotees of the Virgen de la Soledad deemed it but proper to accord Her an abode of Her own where she could reign supreme. They were not satisfied to enthrone Her in one of the seven churches of Cavite puerto. A shrine befitting the unassuming majesty of the spiritual Mother is where the image of the Virgin should belong. So they built for Her the Ermita de Porta Vaga. 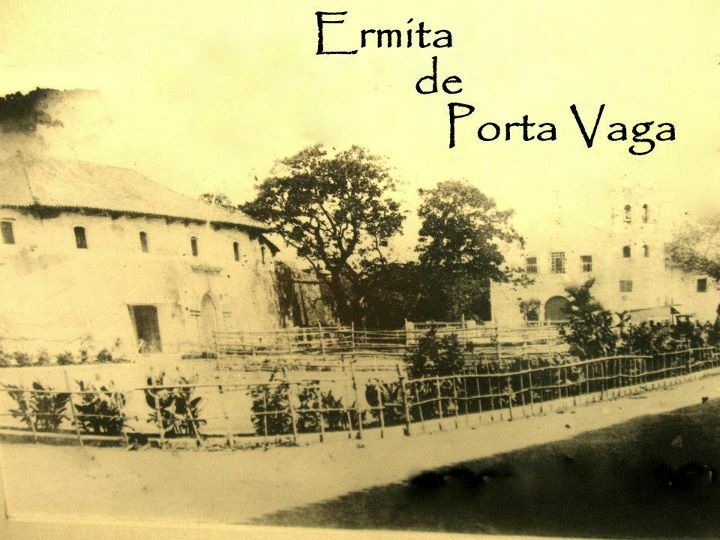 Ermita came from the Spanish word which means hermitage. It was called Ermita for it was such a solemn place where people could commune with God in prayer and silence. De Porta Vaga was added because it was built near the Porta Vaga gate. 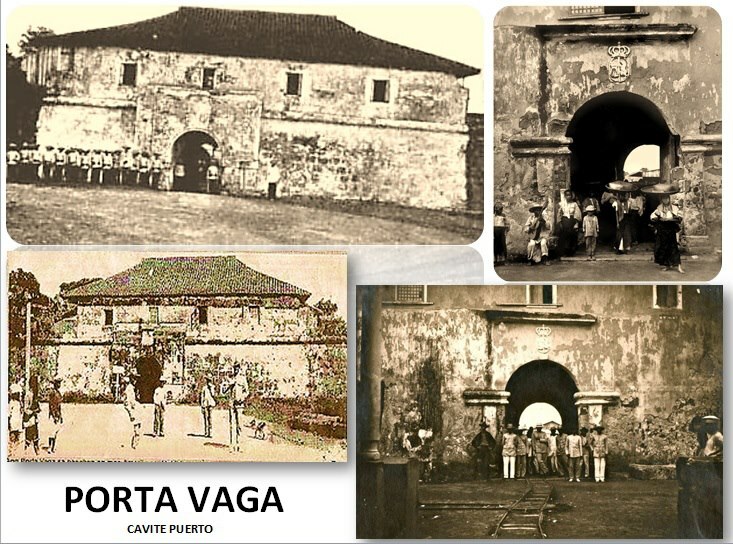 The fortlet guarding the entrance to the Puerto de Cavite was originally known as Puerta Vaga. According to Fray Joaquin Martinez de Zuniga, O.S.A., Vaga came from the tagalog word bago which means new. 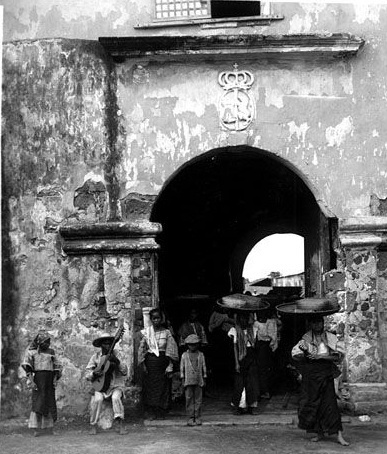 This gate was comparatively new as compared to the ancient walls of Fuerte Real de San Felipe. Thus, Puerta Vaga evolved into Porta Vaga. A section in the Almanaque de Nuestra Señora del Rosario, mentioned that the Recollect Fathers, with Father Cenon Naya as its first curate, built the Ermita in 1612. However, the Recollect Fathers arrived in Cavite in 1616 and the Virgin was found in ca.1667. Thus, this date – 1612 is untenable. 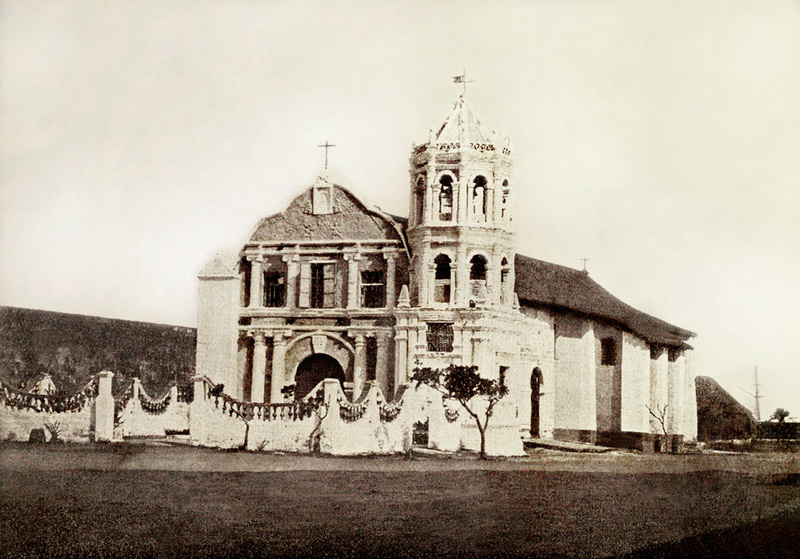 Others claimed that the Jesuits were the ones who built the Ermita. Up to this day, no one really knows the truth.